The TCR is even more trackworthy than the current GTI. The current VW Golf GTI is a marvel. We should know. We've driven it. Still pretty affordable at $27,595 (base MSRP), its quick, well-built, and a hoot to toss around. Then there's the all-wheel drive Golf R with 288 hp and a 0-60 time of under 5 seconds. Righteously fast and perfect for Chicago winters with its high traction. Now, as a farewell to this current (7th) generation that's been built since 2012, Volkswagen has made the 290 horsepower GTI TCR. The same turbocharged 2.0-liter 4-cylinder engine gets massaged for more ponies, and the results should be incredible. The body is the same, but more aggressive graphics, wheels, and paint add some sinister. If you're asking yourself if the TCR will have all-wheel drive like the Golf R, that's not going to happen, so the GTI TCR will be driven only by the front wheels. That's a lot of power for the fronts to manage, so we'll see how that plays out. The current 228-hp GTI manages torque steer very well, so hopefully, the additional 62 horses won't overwhelm the front tires. 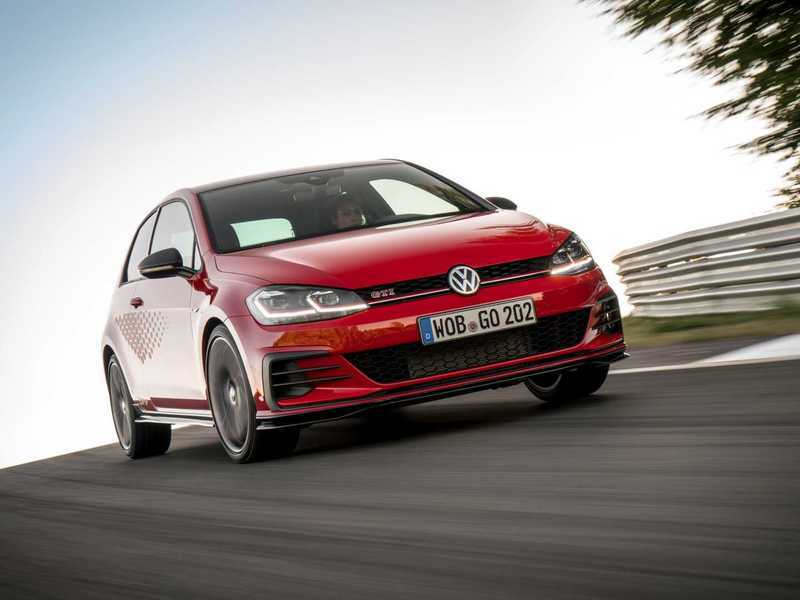 0-60 should arrive in 5.6 seconds, just a little bit slower than the R. Top speed will be 155, matching that of the R.
There's more racing equipment to elevate the TCR above the conventional GTI, including a locking front differential, more powerful brakes, a three-spoke flat-bottom sport steering wheel, and special graphics sport seats. The TCR will also get upgraded gloss black18-inch alloy wheels, special body graphics, additional black trim, and more aerodynamic bits. It still has the same attractive hot hatch shape we've come to know and love, but it looks more track-ready. So, what's the news on the sale of this new, more powerful GTI? Well, the good news is that the TCR will go on sale in the next few months. The bad news is that we probably won't see it for sale in America, unfortunately. The price will be a hefty 38,950 Euros (the equivalent of $45,000 USD), which is considerably more than the GTI and a few thousand more than the R.
The fact that we might not see it for sale here is kind of a gut punch to enthusiasts, considering this will likely be the swan's song for this generation, as the Mk 8 will be ushered in for the 2020 model year. It's expected to have over 300 horsepower, which will eclipse any GTI the world has ever seen. By submitting this form, you are agreeing to have the seller contact you at the phone number provided via live, prerecorded or autodialed calls for the purpose of providing you with additional information on this vehicle.